One-time series. Available as long as supplies last. New Vehicles for the Postal System! In the period when the German Federal Postal System was a state-run enterprise, the Postal System's pool of vehicles was strictly regimented. A few mass-produced types were purchased as basic vehicles, which were then equipped appropriately for their planned use - VW Beetles, later the VW Golf, VW Transporter and Bus, Mercedes 309 / 406 / 508 and others. An exception was the VW Small Transporter, which was specially developed for the Postal System. The vehicles for the Yellow Mail for mail and package service were always painted in the German mailbox yellow color. The Gray Mail for the lineman's service had both gray and yellow vehicles. Many vehicles were shifted during their service life from one area of the business to the other, but their paint scheme did not change. The Postal System's vehicles went initially from the assembly plans of the auto industry to special firms, which carried out the required installation and conversion work in a standardized fashion. When these vehicles were delivered to their assignments in the Postal System, different types of vehicles from different automobile brands could be seen in a train. 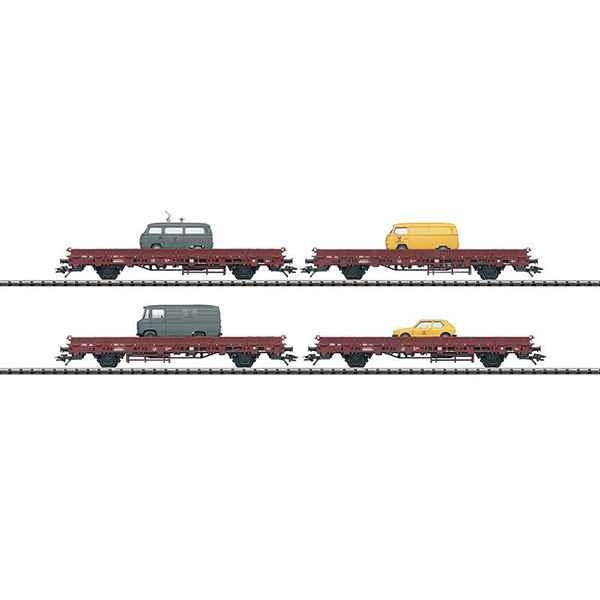 Each loaded railroad car from the display is available separately. (Marklin) 70 01 50 AC wheel set. The class 290 is the right locomotive for pulling these cars through industrial areas and switch yards. Item no. 22206.